Despite Indonesia’s proximity to Australia, my exposure to Indonesian food is pretty slim. And no, packet mi goreng most certainly does not count! So one evening, Tristan organised to have dinner with some good friends L and K at one of their local restaurants, Warung Agus in North Melbourne. It’s on Victoria St on the opposite side of the road to the gorgeous Libertine. 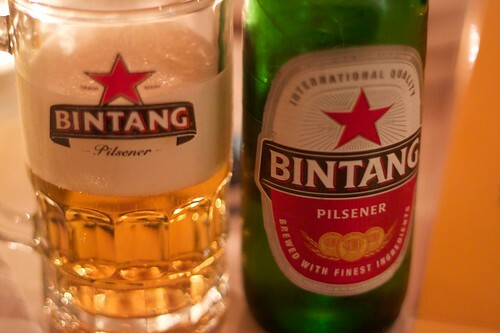 Laugh if you like, but Bintang is the order of the day. It suits the food most excellently. We skipped entrees and ploughed straight into the mains. L and K were at hand to advise us of some of their favourite dishes. K is a vegetarian and seemed very fond of the toge – a traditional Balinese gado gado comprising steamed vegetables, beancurd with peanut sauce and cassava crackers. The sauce really made this dish – it was unbelievably tasty. The crackers were light and just like the prawn crackers that melt on your tongue, yep the ones you get with your Chinese takeaway. Another fab vegetarian dish is the Tuung Mebasa Santen Lalah Manis – sliced eggplant and tofu braised in coconut milk, sweet soy and spicy gravy. I’m not mad keen on eggplant so didn’t think I’d end up having much of this, but again, was blown away by how delicious it was. I tell you, it’s their sauce. There was quite the fight to mop up leftover sauce! Our other two dishes were of the omnivore persuasion. 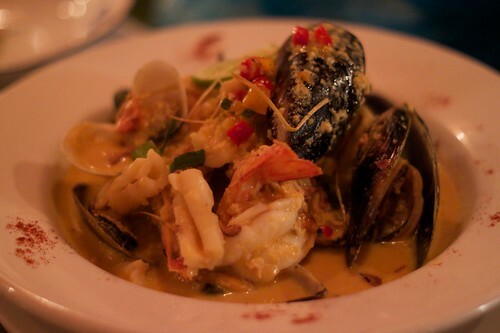 One being a seafood one: Campuran Be Pasih Mebasa Kental, seasonal seafood like prawns, calamari, mussels in spicy coconut sauce served with rice. It sure was spicy! 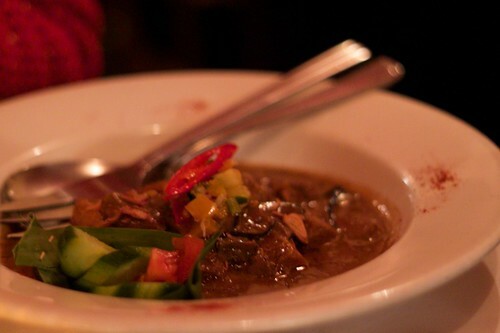 This was the dish I recall going best with the Bintang, precisely because of the chilli heat. The last main was undoubtedly a carnivore delight. K graciously watched as three ravenous beasts, her dining companions wolfed down the Babi Guling, the traditional Balinese roasted pork served with crackle and lemongrass, chilli and ginger sauce. Warung Agus actually allows you to book a suckling pig feast, similar to the Libertine one where you need to book in advance and have a minimum number of diners. It’s wonderful that two restaurants so close to each other offer such diverse versions of the humble suckling pig feast. This was actually the mildest of the dishes we chose and cooked to perfection: velvety soft meat and fat with super crunchy crackling. Four mains even between four hungry folks will leave you full to the brim, especially if you have rice (which you should do). I loved that the rice was served sprinkled with dry shallots – they are so fragrant and add a touch of Asian pungency to an otherwise plain staple. 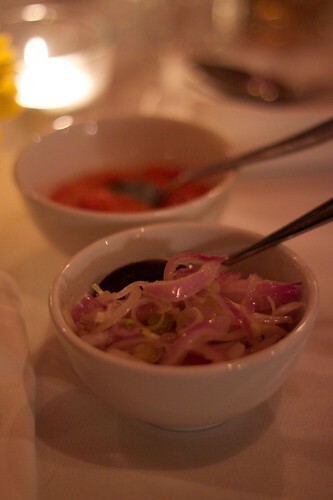 Other condiments are also provided. 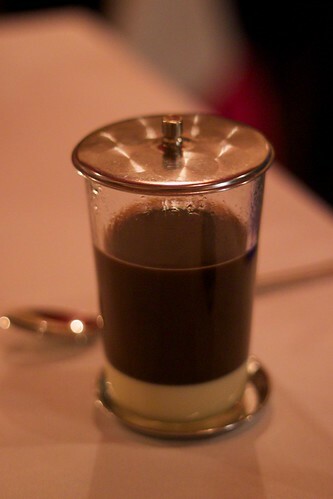 There was absolutely no space whatsoever for dessert, but our adorably friendly waiter did manage to tempt us into trying out Indonesian coffee, which is sweet and rich. An excellent ending to a wonderful meal. Though mains start at $20, they are pretty big and unless you’ve got a gargantuan appetite, they are made for sharing. The restaurant is a little dark but is lavishly decorated – there’s even a special four-poster area you can request to dine in! Almost makes you believe you’re in the tropics, especially with the Gamelan music chiming gently in the background. Thanks L and K for showing us the ropes at a fab local haunt of yours! This entry was posted in eatie-foodies dining out and tagged Indonesian food, Melbourne, North Melbourne, Warung Agus, West Melbourne on October 11, 2010 by gem. I guess Gem and I will just have to travel to Sydney more (or you come to Melbourne more?!)!!! …but seriously, a good place to start for Sydney blogs would be http://www.urbanspoon.com/blogs/70/Sydney.html, and I’m sure Gem has some more specific recommendations too. The lovely @reemski (herself a Syd food blogger) has left some recommendations of her fave Syd food blogs here. Just scroll down till you get to her comment. As a uni student I went to a great place called Bali Bagus on Sydney Rd but I don’t think it exists anymore. The chef was from Bali and ran the restaurant with his Aussie wife. I did notice a new Indo restaurant open up in the CBD with the same name and am keen to see if the same couple are behind it. Possible food blogger expedition…? I’m always on the hunt for a good gado gado, thank you! When in Bali I live on on Padang food (kind of like Indonesian fast food served at roadside stalls) and have found a place on Commerical Rd in Prahran called Bundo Raya which does a pretty good version of it. Thanks for the rec, will have to check it out! I don’t get out that way much. I will definitely visit again! Such beautiful food. 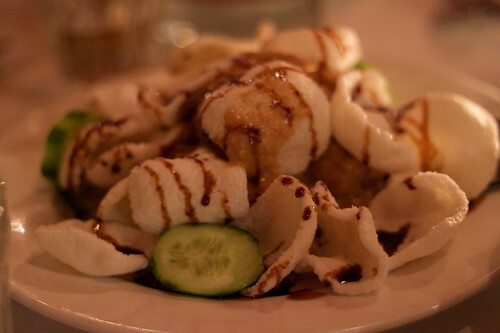 Next time you go, make sure you have the avocado with satay sauce. Seriously. Divine. In fact, next time you go… can I come too?